With engraving level precision, as well as the capability of machining in a wide variety of materials, the ShopBot MAX offers the power and accuracy of our ShopBot Desktop—in a larger format. Choose from two deck options: an aluminum tool deck or a Universal Vacuum hold down deck. The ShopBot Desktop MAX offers the same power and impressive precision of the ShopBot Desktop on a work bed twice the size, 36" x 24". The entire unit conveniently uses standard household 120v electrical power. The Desktop MAX is great for an endless variety of cutting, drilling, and carving operations on a variety of materials including: wood, MDF, plastics, foams, vinyl, and aluminum. It’s great for rapid prototyping, and taking your projects all the way to finished products. The Desktop with Aluminum Deck (general purpose deck) comes standard with an attached MDF spoil board and is considered our most versatile deck option for a wide variety of machining options. Because the Desktop MAX is completely open underneath and the aluminum deck can be partially or completely removed, you can add widely available dovetailing or end-milling attachments. The Desktop with Universal Vacuum Hold Down Deck kit includes a plywood plenum, MDF spoil board, and the ShopBot VacuubeTM for quick hold down of sheet goods. This deck option is not optimal for cutting small parts, but is well-suited for large parts without additional hold down from screws, nylon nails, or tabs. There is increased environmental noise due to the vacuum motor and hearing protection is highly recommended (82db). See the Hold Down at a Glance chart for more information on hold down. Impressive cutting speeds of up to 4 inches per second (depending on cutting bit and material) and rapid transit speeds of 6 inches per second. Positional accuracy of +/- .002”. Z-zero Touch-Off Plate and XY Proximity Switches. 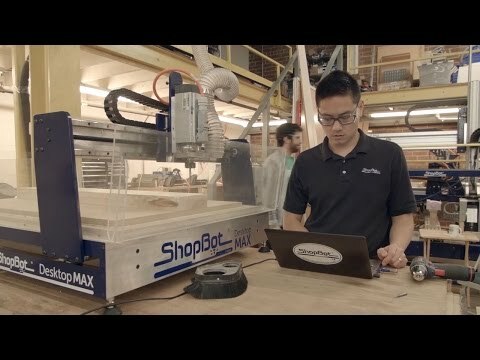 ShopBot Control System software to run your CNC. Dust Skirt ready to connect to your dust collector. Shipped as four ready-to-assemble modules. On-site assembly and training available. Free Tech Support and User Forum. Nominal Cutting area and Total Movement Area refer to the areas that can be covered using a single z-axis. Actual cutting width is decreased by 10” when using a second Z axis. Weights: If crated, add 178 lbs. Sign makers are using CNC for 3D carving, V-bit carving, profile contouring, fluting, and engraving. It also provides them with the opportunity to cut their own channel letter components, frames, posts, and borders in-house. High-volume furniture and millwork companies, as well as novice and master craftsmen, are embracing CNC technology. Craftsmen are quickly realizing that the CNC process doesn’t jeopardize their pieces' authenticity; it only adds to quality and uniqueness of the finished product. Whatever size manufacturing business you have, success today is about agility. ShopBot tools give you the ability to accommodate shifting priorities. Learn more about manufacturing with CNC. No educational setting is complete without a ShopBot. Our digital fabrication tools take STEM learning to the next level. Learn more about CNC in education. The Desktop MAX Mini Enclosure allows you to keep hands safely out of your Desktop cutting area, and help keep chips and dust off your floor. Easily attaches to ShopBot Desktop t-slot deck with included hardware. The front panel is easily removed for easy access to the tool bed. Enclosure is made from Duraplex- Impact resistant acrylic. Color shown in product rendering is for display purposes only, actual product is clear. The Desktop MAX Full Enclosure is made of steel and acrylic, reduces noise and dust for Desktops in high traffic, community work spaces. It keeps hands safely away from the cutting area. For additional safety, the spindle automatically turns off when the enclosure door is opened. Assembly required. Universal Vacuum Hold Down Deck kit includes a plywood plenum, MDF spoil board, and the ShopBot Vacuube™ for quick hold down of sheet goods. Desktop MAX ships fully assembled and runs on standard household power. Availabe in both 110v and 220/230v. Reduces noise and dust for Desktop MAX tools in high traffic, community work spaces. The full enclosure keeps hands safely away from the cutting area. Assembly required. Includes a selection of 7 bits to get you well on your way to cutting various projects..